If Concussion was an actual awards player that never hit the mark that a lot of people thought it would, then Freeheld is one that never even made it a few inches off the ground. Coming not long after last year’s historic decision to legalise gay marriage in the United States – it’s even referenced in the final post-script titles before the credits – it came into the film festival circuit with high anticipation, yet all but vanished after the lukewarm reception it received following its debut. And, sad to say, they were on to something; Freeheld, despite the best of intentions, is a disappointingly underwhelming film that doesn’t do the inspiring real-life story much justice. The film, in addition to being based on the real-life case of decorated New Jersey detective Laurel Hester (played here by Julianne Moore) being denied the right to pass on her pension benefits to her domestic partner Stacie Andree (Ellen Page) when she is diagnosed with late-stage lung cancer, also took cues from the Oscar-winning short documentary of the same name, and it’s probably not unfair to say that the documentary is a far better representation than the more mainstream dramatization. For one, the characters here are way more flat and dull, or at least they’re written as such by Philadelphia writer Ron Nyswaner, and the drama and how it’s played out has all the subtlety of a jackhammer to the groin. At least with Cynthia Wade’s powerful piece of film, you are given enough insight to who these people are without going overboard with the dramatics; you really feel for both Hester and Andree as they are forced to deal with the damning decisions made by the Ocean County “freeholders” and how the public truly came to their aide when the authorities wouldn’t budge. You don’t really get that in director Peter Sollett’s dramatized version, as it takes the very basic elements of these real-life people and plays it extraordinarily safe without ever developing the people we’re programmed to root for in a scripted film like this. Sometimes it can be structured like a Lifetime Movie of the Week, with elements of a cop drama thrown in for no real reason other than to show Hester and work partner Dane Wells (Michael Shannon) being fairly competent at what they do on the force – not to mention a rather unnervingly unintentionally funny moment involving Moore’s Hester and a moving car – which is probably not how a story like this should really be structured. There are times when it shows promise as a potential crowd-pleaser, particularly towards the final act, but even if it works it’s very minor amidst the film’s low-reaching standards – although the moment Steve Carell suddenly shows up as “middle-class Jewish homosexual” activist Steven Goldstein, acting like he’s from a completely different and more light-hearted movie, is also when things get just a little spark of life that it so desperately needs. Carell is just one of the big names in what is honestly a very good cast, all of whom are definitely trying their hardest to make an overall weak script actually work on-screen. Moore and Page work well together as the central gay couple, and while theirs isn’t a particularly crackling chemistry it is serviceable enough to have you believe they are at the very least genuinely in love with each other. Though Moore has the heavier role to portray, undergoing strong make-up and physical restrictions to portray Hester in the admittedly affective later stages of her cancer – affective only because of her strong performance – Page brings something quieter and more charming to her portrayal of Andree, which can actually make for some of her strongest moments as an actress in years. It’s also Page’s first major role since coming out as gay two years ago, which is a highly celebratory event in and of itself, and it’s no coincidence that she probably decided to go with this film as what could be a revelatory time in her career, something we have no problem with if she’s this good from here on out. Like we said, the dramatized Freeheld, like the documentary that came before it, has nothing but good intentions, and highlights a real incident that did pave the way for gay rights to become more and more prominent in modern society – but if you want a film that actually does it justice, make sure it’s the one that actually portrays the people instead of cardboard cut-outs that resemble the people. 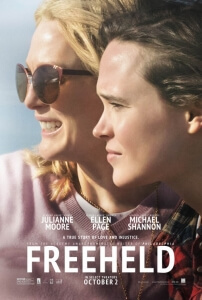 Freeheld undeniably has good intentions, but fails to do the real-life story of Laurel Hester justice with a paper-thin script and overly-safe and unsubtle direction that undermines even its talented cast, who do the best they can with the weak material, that ultimately makes it inferior to the documentary of the same name.